In my never ending quest for all things kitsch I often come across really bizarre-o stuff, sites, people, etc. I came across this site the other day and it just sort of stuck with me. I had sent the link to several friends thinking that they would see the humor in all the tackiness, but alas, I have learned that I am all alone in my silly sense of humor. Yet even with that fact now known and understood, I still have decided to share this with even more people. Now everyone can have a laugh at the expense of... well, really cheap home décor of the Biblical nature. Enjoy the things that only a grandmother would love…. 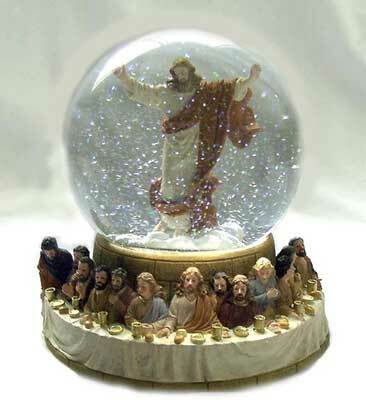 Look, I don't care if you ARE the son of God, it's still considered rude to hover over your dinner guests in a giant glitter ball.